A piglet in New Zealand is learning to surf. Zorro the pig joins his owner surfer Matthew Bell every morning for a board lesson. ‘He’s up at six in the morning and runs down to the beach to check the surf with me’ says Bell. According to Bell, Zorro, who is a mixture of kunekune and domestic pig, loves his surf lessons, although he does get a bit nervous. Zorro doesn’t stay on the board very long but when he falls off he is an accomplished swimmer. ‘We’ll keep on surfing until he gets to the size where he is unmanageable and then we’ll see what happens after that…..He’s a phenomenal swimmer. He goes for it,’ says Bell. 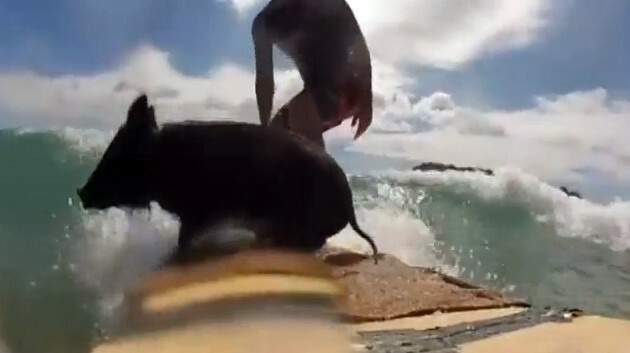 Watch a video of Zorro the amazing New Zealand pig surfing.